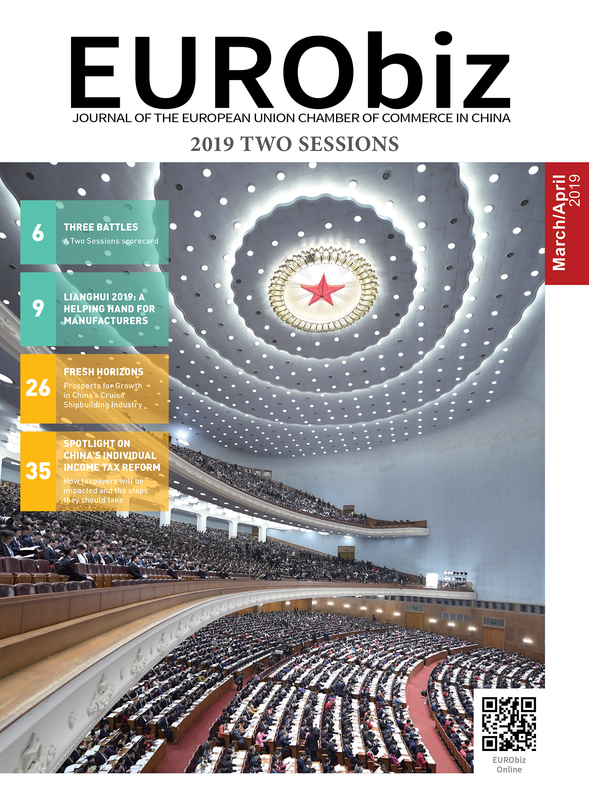 On 10th July, the European Union Chamber of Commerce in China (European Chamber) launched its third annual thematic report, titled 18 Months Since Davos How China’s Vision Became a Reform Imperative. In a morning launch with media and members of the diplomatic community, Mats Harborn, president of the European Chamber, presented on the report’s key findings before engaging in a question and answer session. Later that afternoon, a members-only launch was held followed by a roundtable driven by questions from the audience. The report begins with an examination into the commitments made by President Xi Jinping in his landmark speech at Davos in January 2017. In his address to the World Economic Forum, President Xi spoke highly of economic globalisation and the multilateral trading system. At the same time, a bold reform plan was announced to open up China’s market and take a leadership role in the global economic system. Having heard promises in the past that failed to lead to tangible results, the business community would normally have been less than optimistic. However, the simultaneous promulgation of the Notice of the State Council on Several Measures on Promoting Further Openness and Active Utilisation of Foreign Investment (State Council Document, Guofa  No. 5) raised hopes that this time would be different. State Council Document No. 5 represented a major shift towards the market conditions long sought by European Companies. The contents of the document, which included unambiguous clauses about expanding market access through a unified negative list on foreign investment and providing national treatment for international businesses registered in China, was reminiscent of the sort of grandiose opening that was the norm in the 1990’s. Seven months later, a second document was released. Reiterating the main points of the previous document, the Notice of the State Council on Several Measures for Promoting Foreign Investment (State Council Document, Guofa  No. 39) provided further details, including calls for timetables and roadmaps for market opening. As the report notes, discussion of these documents led to a different set of expectations for both Chinese officials and European business leaders. Meetings with high-ranking officials indicated that, from a policy perspective, the reform agenda had been reinvigorated. European businesses, however, were left uncertain, with limited results on the ground. The European Chamber performed an ‘audit’ of the reform agenda. By examining the tangible results experienced by members, in a variety of industries, the successes and shortcomings of the reform agenda became clear. In short, the optimists that proclaim a new era of opening is well underway and the pessimists that are already declaring this round of reforms to be dead on arrival are both wrong; the reality is less black and white. The pace of reform has been quicker in the last 18 months than any time since China’s World Trade Organization (WTO) accession in 2001, but that does not mean the pace meets the international community’s needs. Environmental protection enforcement: Having risen as a priority for the Chinese Government, environmental protection policies have been substantially bolstered. Officials have been empowered to enforce them and mete out real consequences for non-compliance, and domestic Chinese firms are increasingly being held to stricter standards. Local business environments: After an early 2018 call from the State Council to foster more efficient and responsive business environments, many local governments have begun to enact reforms and communicate these changes. A number of administrative procedures have been streamlined and processing times reduced. Consumer goods: Standards setting, approval processes and consumer safety have seen steady progress, and Chinese regulations are beginning to align more with international norms. In addition, tariffs on a wide selection of consumer goods saw substantial decreases, with many rates being cut in half. Research and development (R&D) environment: Incentives for R&D at both the national and local level are increasingly valuable, and more and more are becoming equally available to international companies. While indicative of progress, a series of announcements that China would raise equity caps on foreign investment was found to have fallen short. Raising equity caps in the financial sector and in the automotive, ship-building, and aerospace industries was welcomed by the report, but members in those sectors noted that raising equity caps alone would do little to change their investment decisions. The message was clear: many European players will remain in joint ventures (JVs) due to the shortcomings found in China’s business environment. State-owned enterprises (SOEs): Central SOEs have been strengthened to the point where their size and influence prevents private competitors from entering the market. Furthermore, any attempt to steer SOEs into becoming more market orientated has been hamstrung by deeper integration with the Party and a heavier reliance on SOEs to address political and social issues. Intellectual property (IP): Despite the relative success, and imminent expansion, of China’s specialist intellectual property rights courts and the introduction of higher fines for infringement, very serious concerns remain. China’s continued practice of using unfair technology transfers is particularly concerning, the effects of which are becoming increasingly visible. IP concerns related to cybersecurity, the tightening of internet censorship and the control of virtual private networks are additional factors that are seriously damaging China’s reputation as an investment destination and are contributing to increased global tensions. Regulation: China’s regulatory and administrative environment is struggling to keep pace with its increasingly sophisticated market. Lengthy approval periods, complicated administrative procedures and overbearing regulations, like the Cybersecurity Law, are major burdens to both Chinese and international firms. Unequal treatment:International businesses are forced to compete on an uneven playing field. Some of the main issues include unequal access to licences, financing, subsidies and legal recourse, discretionary administrative treatment, customs issues and greater scrutiny from authorities. Unpredictable and ad hoc policies: Frequent and unforeseeable shifts in policy make doing business in China difficult, particularly for those in industries that have to develop long-term strategic plans. This has increased policy risk across the board from the automotive industry to the financial sector. The findings of the report further stress that the pressure on China to realise its reform vision is rapidly rising. In relative terms, reform is happening more quickly than in recent memory, but in absolute terms progress has been slow. Domestically, China faces a maturing but slowing economy. The practice of protecting young industries that could not viably compete with global giants may have helped them grow, but now, they are in dire need of competition in order to become more efficient. Beyond that, Chinese businesses increasingly demand a fair and well-regulated market where they are not forced to compete against firms that are favoured by the government. Internationally, patience is wearing thin. The most blatant expression of frustration at the slow pace of reform is the United States, with the Trump Administration unilaterally escalating tariffs as part of a drive to address the shortcomings of China’s opening up. While less prone to acute moves, the EU and a variety of other economies share the US’ concerns. Release unambiguous timelines and roadmaps for State Council Document No. 5 and the Notice of the State Council on Several Measures for Promoting Foreign Investment (State Council Document, Guofa  No. 39), and report on their progress in a timely manner. Create more favourable operating conditions, with a focus on strengthening institutions and implementing rule of law, in order to create a transparent and predictable legislative environment and to improve regulatory enforcement for businesses and reformed SOEs. Work with the European Union (EU), and within the framework of the WTO when necessary, to positively address IP concerns. Engage with the EU to successfully complete, in a timely manner, a meaningful Comprehensive Agreement on Investment. Share the post "18 Months Since Davos"